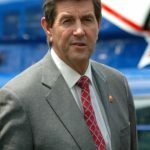 Robert Renfroe Riley is an American politician and a member of the Republican Party who served as the 52nd Governor of Alabama from 2003 to 2011. "Half a world away nations that once lived under oppression and tyranny are now budding democracies due in large part to America ‘s leadership and the sacrifices of our military." "Government does not create jobs. It only helps create the conditions that make jobs more or less likely." "I hope we never get to the point that we put ourselves in Jesus’ place. But when I read the New Testament basically, we get three mandates: to love God, to love each other, and to take care of the least among us. And I think this is at least a step in the right direction." "Tolerating evil leads only to more evil. And when good people stand by and do nothing while wickedness reigns, their communities will be consumed." "I ask you: turn a deaf ear to the special interests. Let politics stand down for a while. don’t waste anytime thinking about future elections until we’ve done our jobs here." "The men and women who serve in our military have won for us every hour we live in freedom, sometimes at the expense of the very hours of the lifetimes they had hoped to live." "Ladies and gentlemen: There can be no greater investment in Alabama’s future than an investment in education." "For too long, we have focused on our differences – in our politics and backgrounds, in our race and beliefs – rather than cherishing the unity and pride that binds us together." "The amount of money we spend on education is important, but not nearly as important as how the money is spent."